NOTES: Engraved panels, 22 resins,2 clear vacs,10 white metal, 27 plastic parts. 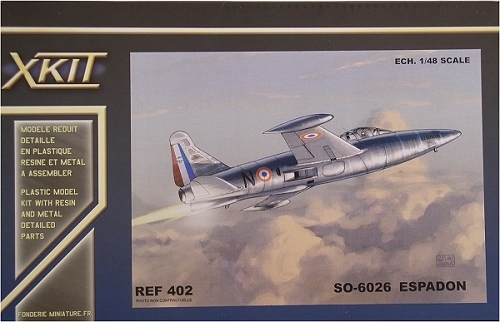 In 1945, the French firm SNCASO (for Société Nationale de Construction Aéronautique du Sud-Ouest = South West Aeronautical Construction National Firm) decide to develop the first French jet fighter, called SO 6020 under the direction of Lucien Servanty. A 1/10 scale mock up is tested in October in the wind tunnel Nieuport facilities, and in the beginning of 1946, the government contract with the firm . In July, military authorities estimated the potential to 639 combat aircraft for the renewal of the French Air Force. Built around the Rolls Royce NENE engine, the aircraft will never equip the F.A.F, the Ouragan from Dassault will definitively win the market, as the first operational home made jet fighter. But this initial SO 6020 will become SO 6025 and 6026 nicknamed Espadon (as the fish, due to the design) and these test bed prototypes will allow to the French industry to gain experience in the several domains, SEPR assistance rockets, Turbomeca reactors…From 1949 to 1956, the 4 aircrafts took off more than 600 times without major troubles, which is a good statistic. The French model maker Fonderie Miniature continues its program in the experimental with the slick Espadon (SO 6025/SO 6026).You’ll recognize the aircraft with their external differences; the 6025 has a long ventral air intake, 3 flat faces on the pointed nose (for recon version), a fin flash, an solid rear cockpit fairing. Due to performance problems during trials, modifications will lead to the 6026 version that will incorporate 2 news rectangular shape intakes in the rear fuselage, a solid four canon armed nose (never installed), a clear visible deck fairing, the deletion of the fin flash, 2 additional wing tip tanks. F M offer us two boxes of the different versions, though some parts on plastic trees will be discard on the 6026 version. The analysis is based on the second kit (SO 6026), and remarks are the same for the other box. The good surprise come with the slick surface of the fuselage, better than older grainy kits that allow us to get good NM finish. The prototype was very simple and the kit is obviously in the same way. Documentation is not very well known, but I get a French made review called LE TRAIT D’UNION, which is a branch of AIR BRITAIN, and deal with the SO 6020 and derivatives. Drawings, and b/w pictures allow me to tell that these kits reflect the reality. After flashes removed, the fuselage halves join well, even without location pins. The wings will require test fitting and putty to join perfectly (think to make a jig to respect the 10° positive angle dihedral ), while you ‘ll open larger the fuselage fences. The stabilisators are 0 angle glue. The long ventral air intake in two parts is not mounted (see red rectangular areas), instead of that, the two resin rectangular intakes will be housed in the pre-scribe panels in the rear fuselage. Surgery is also required around the nose (see internal marked line), cut it and replace the flat sides and under nose with the solid rounded two parts resin “fighter version”. The other differences are the long resin fairing under rear belly, and the wing tips tanks (see green rectangular). 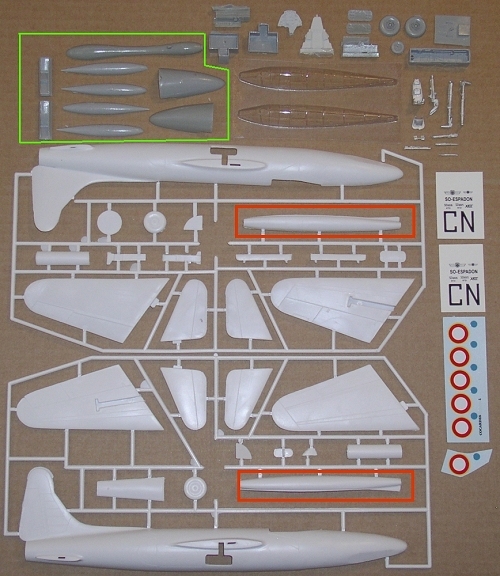 The resin parts are good, cockpit is minimal but correct, with the floor, the two sides, the instrumental panel (paint or ad instrument from spare box ), the rear bulkhead, the ejection seat ( Heinkel type (may be a He162) in with/metal, ad straps.). The interior seems to be flat black overall. The undercarriage is well cast in white metal with brake lines already on the legs. The wheels are a mix of plastic (interior) and resin (exterior side). Here the pattern is well done. As all multimedia kits, dry fitting are necessary for good alignments and “square attitude”. (do not forget to put lead or other molding clay in the nose to get a proper “3 wheel sit”. The clear canopy is double (just in case), and I personally try to polish and deep it in the magic “future” to get better transparency and to clean the finger tips. The decoration is for one aircraft , and you’ll use the N letter (the C is for the 6025 version) on the rudder. All you need is on the decal sheet except the blue white red national flag that you must paint on the rudder. 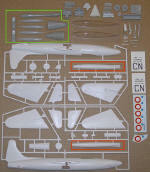 The instruction sheet in French and English is basic but nothing is omitted to build this amazing and graceful aircraft. Once again FM goes aside the tracks, and take financial risk with such “in the dark” models, but as already said, who would involve in such courageous way? Certainly not Trump and other traditional well established companies. But I really do not want to fill my display cases with thousand of P-51, Me 109….. and I really thank FM to offer us very interesting subjects, even if some attention must be taken during assembly. Recommended without reserves.